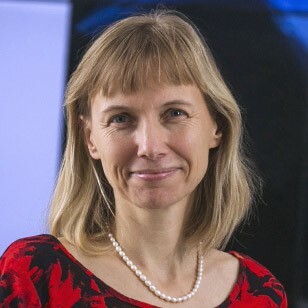 Katy Börner is the Victor H. Yngve Professor of Engineering & Information Science in the Department of Intelligent Systems Engineering & Information and Library Science, School of Informatics, Computing, and Engineering. Adjunct Professor at the Department of Statistics in the College of Arts and Sciences, Core Faculty of Cognitive Science, and Founding Director of the Cyberinfrastructure for Network Science Center at Indiana University in Bloomington, IN and Visiting Professor at the Royal Netherlands Academy of Arts and Sciences (KNAW) in The Netherlands. She is a curator of the international Places & Spaces: Mapping Science exhibit. She holds a MS in Electrical Engineering from the University of Technology in Leipzig, 1991 and a Ph.D. in Computer Science from the University of Kaiserslautern, 1997. She became an American Association for the Advancement of Science (AAAS) Fellow in 2012.